Pack 888 makes the news! Pack 888 is pictured here as a representing Helotes as one of the best places to raise children in Texas for 2013! You look good there Mr. Clark! Pack 888 Volunteers at the Food Bank! 888 is GREAT! We had a great time and spent a few hours over a saturday volunteering at the food bank. Thank you everyone for coming and thank you Casey for setting this up! Cub Scouts met at the Braundera YMCA for some rock wall climbing action. Pack 888 found that we have several "spider-cubs" within the pack! It was an AWESOME TIME! See some of the actions shots below! May marks our final Pack meeting for the school year. Looking back, Pack 888 has come a long way. This time last year, your leaders were in discussions with Father Carlos and Deacon Thornberry on whether or not the Parrish would want a Pack and even if we had enough interest to build a successful Pack. Here we are today, with over 40 registered scouts and over 10 leaders, having given our time to the local community, made the Parrish aware that we are here and ready to volunteer, and had a ton of fun in the process! This summer, we have lots and lots of activities planned and we are always on the look out for new ones! Watch your emails for be sure to check the web site regularly for updates on upcoming events! From all of your leaders, we thank you for all you have done in the last year to make Pack 888 so successful. Without the help from the parents and from the scouts, we would not have been able to accomplish what we did this year. We look forward to being there with you for many years to come and carrying the scouting tradition. 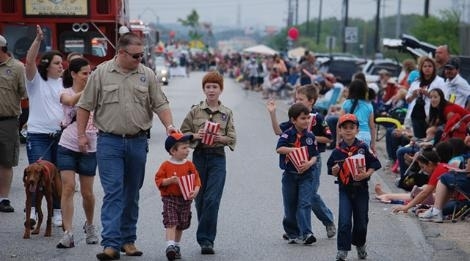 Pack 888 debuted in the Cornyval Parade this year with a float. The theme this year is what we scouts do best: camping!!! With a tent, fire, foliage, canoe, fishing pole, and lantern we presented Helotes with something that embodies who and what we are! The scouts did a great job passing out candy and chanting "888 is GREAT!!!" 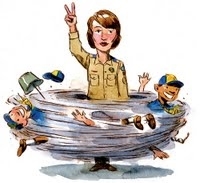 and the scout motto "DO YOUR BEST!" The State of Texas has passed a law stating that any overnight trip of over 72 hours (or more) has to be accompanied by at least one adult trained in an acceptable Youth Protection Training program. To be an acceptable program, there has to be a classroom component. 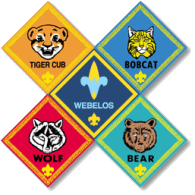 The BSA ONLINE training program therefore does NOT satisfy Texas State requirements. Fortunately, the Alamo Area Council Roundtables for the next two months (May & June) will be having this training. The training takes approximately 30 minutes and then you can break out into the normal roundtable items afterwards. Please make it to one of the next two roundtables if your schedule permits! See the Calendar for dates/times/locations! Website is "launched"! If anyone finds anything that needs to be updated, needs to be added or if you have an idea that you think would be really good to put in our website, just shoot me an email!